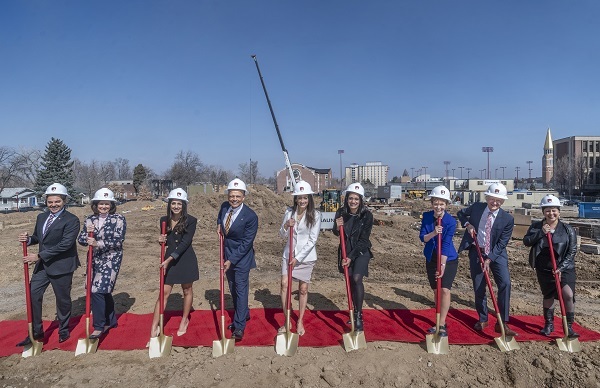 The University of Denver held a groundbreaking ceremony Monday marking the start of construction on a residence hall expected to house 500 freshmen. 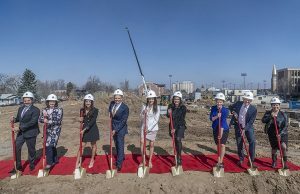 The 130,000-square-foot building, which also will include space for some campus programs alongside the residential units, is being built in the 2000 block of South High Street, north of Katherine Ruffatto Hall. The five-story building is expected to open in fall 2020. It is expected to cost $55.5 million, according to the university’s website. The residence hall will be named the Dimond Family Residential Village, following a $5 million gift to the university from the Dimond Family Foundation, the vehicle for the philanthropy of Navin and Rita Dimond, as well as their two daughters. Navin Dimond is the president and CEO of Denver-based hotelier Stonebridge Cos., which he founded in 1991. Stonebridge owns and/or manages about 60 hotels, about half of which are located in Colorado. Notably, the company is building a 21-story dual-brand hotel at the corner of 15th and Stout streets in downtown Denver, and planning to redevelop the former Emily Griffith vocational school campus a few blocks away. Navin Dimond earned his MBA degree from the University of Denver’s Franklin L. Burns School of Real Estate and Construction Management in 1986, and is on the university’s Board of Trustees. The University of Denver requires first- and second-year students to live on campus, but the college said in a press release that it is seeing more demand for on-campus housing from upper-level students, and that the new freshmen dorm will create more openings for those students. Saunders Construction is the general contractor on the project. Anderson Mason Dale Architects and Moore Ruble Yudell are the architecture firms involved. The residence hall is one of three new buildings DU plans to open in fall 2020. The others are the Community Commons, which will feature classrooms as well as a dining hall, and the Pioneer Career Achievement Center, which will incorporate career planning and alumni offices.